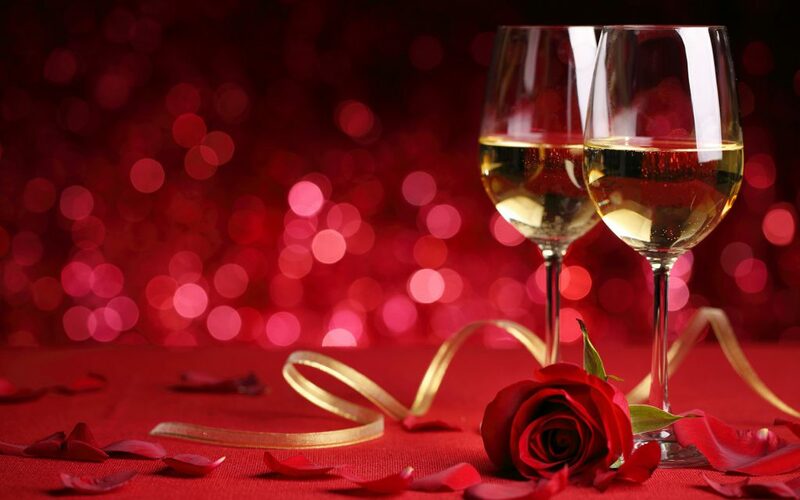 Still trying to decide what to do for Valentine’s day, or rather where to dine? Valentine’s Day is one of the busiest nights of the year for restaurants. Diners’ expectations are high, and restaurants do their best to live up to expectations by creating special menus to make the meal as memorable as possible. 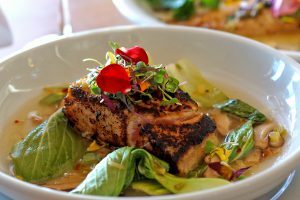 Here are a few Newport Beach restaurants you’ll love that are determined to please your palate on February 14. 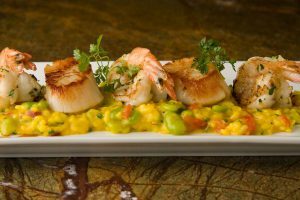 Chef Cathy Pavlos is serving a four-course Prix-Fixe menu featuring your choice of dishes such as Black Canyon Filet Mignon and Plancha-Seared Wild Branzino Filet. Pricing is $75 per person, with an optional $25 or $40 wine pairing. Gluten-free and vegetarian options are available. 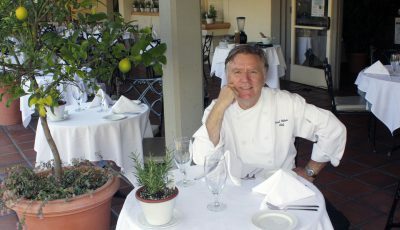 For reservations and a peek at the menu, visit provenanceoc.com. 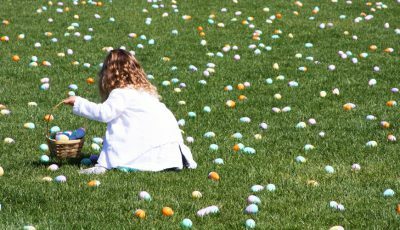 The Winery Restaurant & Wine Bar will be hosting a special Oh Baby! four-course prix-fixe menu created by Executive Chef Yvon Goetz. The menu includes a variety of appetizers and entrees, including rack of venison and beef tenderloin & lobster. Cost is $109 per person. To learn more or to make your reservation, please call (949) 999-6622. See menu at thewineryrestaurants.com. Executive Chef Shin Toyoda has created a prix-fixe Valentine’s menu for two ($180 per couple) that starts with two glasses of Champagne, several appetizers and entrees including Tuna, Fluke and Salmon Sushi, Baked Crab Hand Roll, and a White Lotus Roll. The meal ends with a Chocolate Bomb Dessert served with Tyku Coconut Sake. The regular menu will also be available. For reservations, please call (949) 706-3622 or visit sushiroku.com. 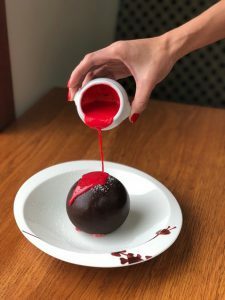 Chef Brittany Valles has created a romantic four-course dinner featuring aphrodisiacal ingredients to be savored with a glass of champagne or rosé. The evening starts with a choice of Beau Soleil Oysters with rose petal mignonette or Burrata and Caviar with strawberries and brioche. The next course is Shrimp Ceviche with Oro blanco or Carrot-Fennel Soup with Vadouvan walnut granola. The third course is Wagyu New York Strip, Chilean Sea Bass, Bone-in Pork Chop or Sunflower Seed Risotto, followed by dessert. Cost is $125 per person. Reservations available by calling (949) 760-4920. Celebrate Valentine’s Day Italian-style at Il Barone. The four-course meal varies in price depending on the choice of entrée. All meals start with antipasti, followed by a salad. For the main course, options include Ravioli with truffles and mascarpone ($80), Lobster and shrimp filled tortellini in a champagne saffron cream sauce ($85), breast of chicken wrapped in prosciutto ($70) and other delights. End the meal with Espresso Tiramisu or Torta all’ Amaretto. Call (949) 955-2755 for reservations. Chef Julio Hawkins is serving a four-course prix fixe menu for $85. Guest will begin the meal with an Amuse Bouche followed by the award-winning Clam Chowder and Winter Berry Frisee Salad. Continue the meal with a choice of entree, with options like the Wild Norwegian Miso Glazed Halibut or Prime Rib. Select from one of the desserts to end on a sweet note. To make a reservation, please call 949 673-8400. Chef Florent Marneau has created a three-course menu with starters such as a beet & goat cheese terrine to poached oysters with caviar to King Crab & prime filet carpaccio. Main course selections include a lamb rack or a gratin of scallops & prawns or pan-seared veal ribeye. Desserts this year include chef Amelia’s Milk & Honey Macaron with burnt honey, macadamia gelato or Chocolate Bourbon Butterscotch Gateau with housemade cherry ice cream. Cost: $130 per person; optional wine pairings for $40. Call (714) 434-7900. Fig & Olive has a $75 four-course Valentine’s Day dinner (wine pairings are $35 for two) with dishes such as Oyster Rockefeller, Steak Tartare, Mushroom Salad, Fettuccine Provençale, Arancia Roasted Halibut, Braised Veal Osso Bucco, Prime Filet Mignon, and Caramelized Pumpkin & Chestnut Risotto. Or, splurge for the special $189 dinner for two, featuring an appetizer, choice of Chateaubriand or Whole Branzino, dessert tasting, and a bottle of wine. 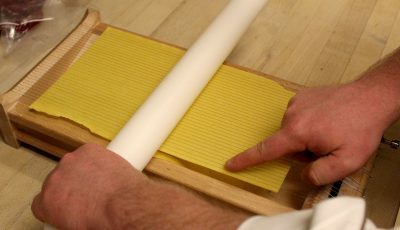 Visit FigandOlive.com. The Bungalow is offering a three course prix fixe menu with varying prices depending on entrée. All diners start with an appetizer, and then have three tiers: $65, $75 or $85, with several options per tier. You can also opt for the $160 Chateaubriand for Two. And of course, all dinners conclude with chocolate mousse and chocolate dipped strawberry. Visit TheBungalowRestaurant.com for the full menu and to make reservations. 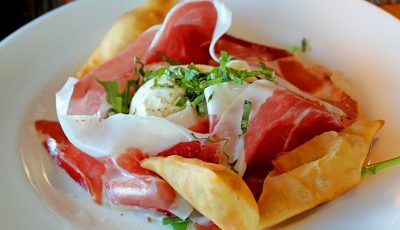 Andrea presents a special four-course Italian lovers’ menu, Il Menu Dell’ Amore, on February 14. From February 15 to 17, a la carte specials will be available. 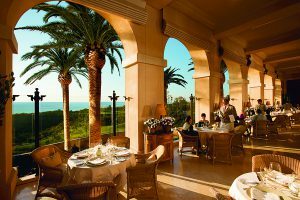 Andrea offers Valentine’s diners a casually elegant ambiance, heated ocean-view terrace, charming live guitarist and exquisite selection of Italian wines. Lunch available February 14 for $90 per person or $150 with wine pairings. Dinner available February 14 for $150 per person or $200 with wine pairings. Please call (877) 563-5102 for reservations. On February 14, Chef Marc at Pelican Grill offers a special three-course menu designed for him and for her. From February 15 to 17, a la carte specials will be available. Spend an evening or afternoon on the ocean-view terrace or in the dining room with an open-display kitchen, while tasting the best of quintessential California cuisine and wine. Available February 14 for $120, or $180 per person with wine pairings. Call (877) 563-5102 for reservations. Five Crowns has a Valentine’s Dinner for Two available February 14 and 15 for $150 per couple. Start with a glass of wine (Justin Sauvignon Blanc or Cabernet), and then proceed to an Amuse of chilled cucumber mint shooter followed by mushroom soup or endive salad. Entrée choices include Double Cut Pork Chop, Potato Horseradish-Crusted Salmon, or Roasted Prime Ribs of Beef California Cut. End with a decadent dessert. Call (949) 760-0331.